For research purposes I have been reacquainting myself with the sillier side of scary cinema of late, and frankly, it has been an absolute joy. I am co-writing a sitcom series set in a ‘scare attraction’ – having worked in a number of them across the capital in the past. Arguably a natural evolution of the ghost train, these tourist attractions have proliferated around the Western world, notably in the last five years. It’s not just independent events or arts groups trying something different at Halloween, but right across the (tourist) board the likes of Disney and, here in the UK, the Merlin Group (Europe’s corporate entertainment giant, the Tesco of the tourist world, if you like) have put a live ‘scare’ element into each of their attractions. These run all year round, from a haunted house to a Chamber of Horrors, Tombs, Crypts, Cells, even the West End phenomenon ‘Le Passage Del Terror’ – seriously, they actually called it that. The working title for our script is ‘Shaft of Doom’ – why not? Unsurprisingly, it is an extremely popular pastime among the Lynx-sodden youth to go into a pitch-black, smelly maze of dry ice and have your wits shat out of you by some terrifying out-of-work actors. The training for these ‘scaring’ jobs is surprisingly competitive and intensive, with those in charge taking it all hilariously seriously – after all, to them, it’s an actual ‘career… in bringing fear’, to quote an ex-boss. What a douche. So I spent a lot of my early performing days convincingly and gorily made-up as some form of insane undead, pouncing from hidden cages to within a millimetre of a startled French school child’s screaming face. Not exactly a demure job but I cared not, it was a lot more fun than handing out flyers or tea. So a few years on and I’m writing on the topic with fellow comic Vicky Stedeford, and like the creators of the wonderful Radio and TV series League of Gentlemen (1997-2002), I want to use my love of film to inform my comedy. I intend there to be plenty a reference in the script, specifically for the delectation of the fellow horror-nerd. In the League there are many specific references to obscure British horror films, which bring a frisson of recognition to fans of the genre and can still be appreciated by non-aficionados as bizarre and surreal. As well as the genre films I’ve watched and kept mental notes of over the last decade, more recently in preparation for ‘Shaft of Doom’ I’ve started watching the obscure stuff, particularly British horror films. Those range from films with a justifiably classic reputation, such as Quatermass and the Pit (1967) – still chilling after four decades, even with the sticky-backed plastic effects – to lesser-known entries made towards the end of this country’s horror boom. 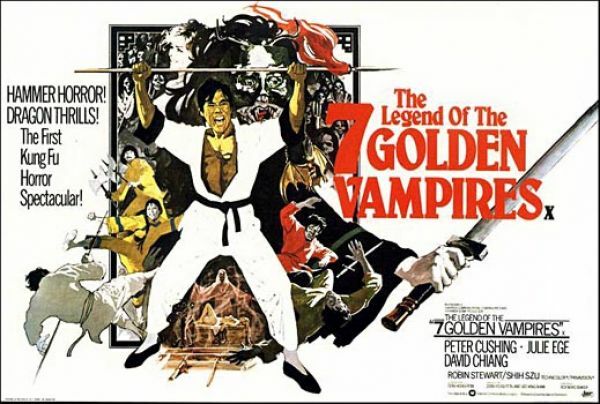 At that time, the genre was dominated by Amicus portmanteau films and strange genre-crossing movies like Legend of the 7 Golden Vampires (1974), which mixed the 1970s fad for Kung Fu with the wane of Hammer’s ongoing Dracula franchise. Late portmanteau films such as The Monster Club (1980), starring stalwarts of the genre Vincent Price, Donald Pleasence and John Carradine, were clearly desperate to include any element that might get bums on seats; that film has bands performing between the horror short stories – unfortunately UB40 only appear off-screen – which range from the laughable to the genuinely touching, such as the tale of a monster hybrid who has the face of a ghoul and sets creatures on fire when he whistles! In my late teens and early twenties, I worked in a wonderful independent video rental shop, which stocked hundreds of incredible titles I would otherwise have never heard of. It wasn’t until that job that I really understood the incredible popular dominance that horror and comedy have over all other genres. There is, after all, pleasure in pain and people want to feel something when they watch a film – fear reminds you that you’re alive. Surprisingly, before I worked there I’d largely overlooked any film that I thought might scare me – I had a terrible relationship with horror. As soon as I was mildly perturbed I would clamp my eyes shut and think about somewhere warm and safe. I sat through too many horrors just watching brief snippets of day-lit dialogue interspersed with long scenes of the inside of my eyelids while coaxing forth some early arthritis through the approximately two hours of permanently clenched fists. So justifiably, I personally considered scary films a waste of time and money. And I know a lot of people, not just women, who still feel the same way. Working in that video shop though, I hated it that there was an entire genre of film, and such a popular one at that, which I couldn’t even comment on. Also, it made me slightly crap at my job. So I took advice from my wiser colleagues and compiled a list of recommended classics. I buckled in and set to actually seeing what these horror films were all about. Fortunately, with a bit of determination I was quickly turned over to the dark side by the likes of The Omen (1976) and The Wicker Man (1973). Over time and exposure you inevitably become a bit desensitised, but films can still make me feel terrified to the point where I can’t watch, and I’m a prolific ‘jumper’ – but I’ve genuinely learnt to enjoy that in a sordid way. And that’s rather a strange psychological shift to acknowledge. Personally I’m most frightened by fast-paced, people-being-chased-type horror films – the two scariest (and most brilliant) films for me in the last decade came out almost back to back: The Descent and Wolf Creek (both 2005). They had me realise films could deeply affect me without them having made me laugh or cry and that was novel. The reason scare attractions are enjoyable is much the same as for horror films – it’s a life-affirming experience, but it’s also a shared and amusing experience. If you see someone else get frightened, it is funny. The other sound you hear in horror auditoriums and scare attractions alike, aside from gasps and screams, is laughter. Hence my renewed interest in them now, from a comedic perspective. Vicky and I hope to tread that delicate line between scary and funny – but it’s no mean feat. In order to buff up for this I’ve been watching films that also cross that divide, intentionally or not! I’ve watched a lot of Hammer, Amicus and other films from the same time and it’s been the most fun ‘research’ I’ve ever done. One of the funniest things I’ve seen is the ‘candle-tug’ in Twins of Evil (1971). The heroine’s laid out on a stone slab, surrounded by vampires admiring her own ‘twins of evil’ and in a fit of totally unwarranted ecstasy/agony she arches her back and clearly tosses off the candle behind her – what? I love it. And there’s genuinely scary stuff in there too; most notably, I found the metallic tinkling rattle of the advancing zombie peasants in Legend of the 7 Golden Vampires truly unnerving. There’s a lot to be inspired by and a lot to draw from.